Good location, walkable to most of the tourist things (Royal Residenz, etc). Easy access to the underground. Wonderful breakfast and extremely nice staff. Beds and pillows were NOT great, and the area is pretty noisy, especially at night. Bring earplugs! But a good value in the heart of the city. Location! I also liked that you could open the large windows for fresh air. Did not have the breakfast. The beds were comfortable. The two bathrooms were clean. Entry to the building was with a key card which enhanced the security. The hotel is fairly close to fun shopping areas. Walking to the Deutches Museum and Marienplatz was doable but was a long stretch. Staff very helpful and it our second time to stay there. They upgrade our room as well which is great. Breakfast very nice. Met our needs: washing machine, close to the old town, affordable. The beds were comfortable. The room was clean. Close to Karlplatz & Marienplatz, clean & nice service. Lock in a great price for City Aparthotel München – rated 8.1 by recent guests! City Aparthotel München This rating is a reflection of how the property compares to the industry standard when it comes to price, facilities and services available. It's based on a self-evaluation by the property. Use this rating to help choose your stay! One of our top picks in Munich.The family-run City Aparthotel München is in the center of Munich, a 2-minute walk from Karlsplatz (Stachus) Square and Sendlinger Tor. It offers air-conditioned, soundproofed apartments with free WiFi internet in all areas. Munich's pedestrian area begins here, and excellent public transport connections are available. The Oktoberfest beer festival is 2 train stops or a 20-minute walk away and the neighborhood Ludwigsvorstadt is well liked by fans of history and architecture. 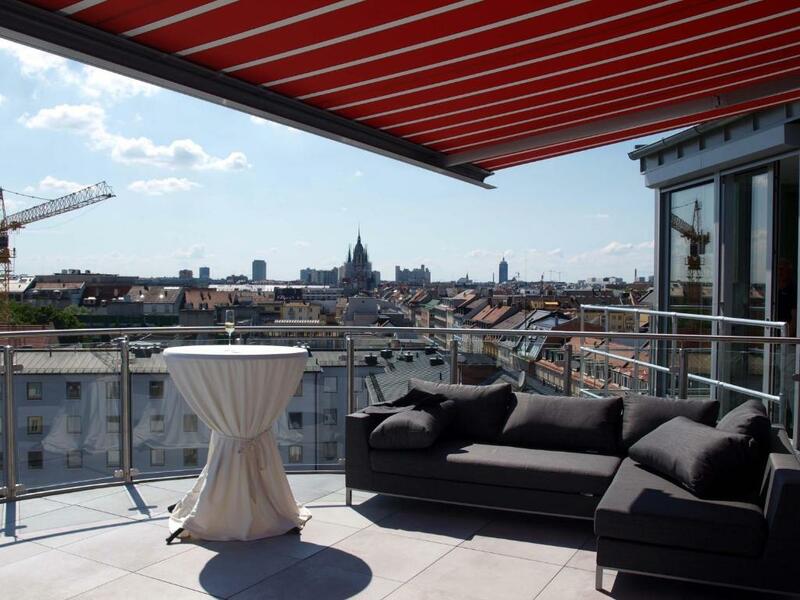 뀐 Located in the real heart of Munich, this property has an excellent location score of 8.8! When would you like to stay at City Aparthotel München? This room features a 42-inch flat-screen TV and a safe as well as an iron and an ironing board. The bathroom has a walk-in shower and a hair dryer. These rooms can accommodate a maximum of 2 guests. Please note that no extra beds can be accommodated at the property. Baby crib is available upon request. This apartment with double bed features a sofa bed for 2 guests, a 42-inch flat-screen TV as well as an iron, an ironing board, a drying rack and a kitchenette with microwave, fridge and a 2-burner induction stovetop. The bathroom has a walk-in shower, a hair dryer and a washing machine. These rooms can accommodate a maximum of 4 guests. The existing double bed can be separated into two single beds. Please note that no extra beds can be accommodated at the property. Baby crib is available upon request. This apartment has 1 bedroom and a living room with a sofa bed for 2 guests, and features two 42-inch flat-screen TVs as well as an iron, an ironing board, a drying rack and a kitchenette with microwave, fridge and a 2-burner induction stovetop. The bathroom has a walk-in shower, a hair dryer and a washing machine. These rooms can accommodate a maximum of 4 guests. Existing beds can be separated. Please note that no extra beds can be accommodated at the property. Baby crib is available upon request. This room features a 42-inch flat-screen TV, a laptop safe, as well as an iron and ironing board, a drying rack and a kitchenette with microwave, fridge and a 2-burner induction stovetop. The bathroom has a walk-in shower, a hair dryer and a washing machine. This apartment features a double bed and a sofa bed for one person, a 42-inch flat-screen TV, as well as an iron and ironing board, a drying rack and a kitchenette with microwave, fridge and a 2-burner induction stovetop. The bathroom comes with a walk-in shower, hairdryer and washing machine. This apartment can accommodate a maximum of 3 guests. The existing double bed can be separated into two single beds. Please note that no extra beds can be accommodated at the property. Baby crib is available upon request. This apartment features two bathrooms with a walk-in shower, hairdryer and washing machine, a bedroom and a living room with a sofa bed for two people. 2 flat-screen TVs, an iron and ironing board, a drying rack and a kitchenette with microwave, fridge and 2-burner induction stovetop are also provided. This apartment can accommodate a maximum of 4 guests. The existing double bed can be separated. Please note that no extra beds can be accommodated at the property. Baby crib is available upon request. This apartment features two bedrooms and a living room with a sofa bed for two people, 2 large flat-screen TVs, as well as an iron and ironing board, a drying rack and a kitchenette with microwave, fridge and a 2-burner stovetop. Both bathrooms come with a walk-in shower, hairdryer and washing machine. This apartment can accommodate a maximum of 6 guests. The existing double bed can be separated into two single beds. Please note that no extra beds can be accommodated at the property. Baby crib is available upon request. This apartment features three bedrooms and a living room with a sofa bed for two people, 3 flat-screen TVs, as well as an iron and ironing board, a drying rack and a kitchenette with microwave, fridge and a 2-burner induction stovetop. Both bathrooms come with a walk-in shower, hairdryer and washing machine. This apartment can accommodate a maximum of 8 guests. The existing double bed can be separated into two single beds. Please note that no extra beds can be accommodated at the property. Baby crib is available upon request. This air-conditioned suite features two bedrooms, one of them with a large double bed, a spacious living room with open kitchen, and a 30 sqm roof terrace. The suite is located on the 7th floor, reachable via elevator. There is a kitchen with fridge, induction stovetop, microwave and dishwasher. One bathroom comes with a double washbasin and whirlpool, while the other offers a shower. 3 flat-screen TVs, free WiFi, safe, washing machine, iron and ironing board are also provided. A maximum of 4 guests can be accommodated. Please note that no extra beds can be accommodated at the property. Baby crib is available upon request. Please note that payment of a EUR 500 security deposit is required. Our apartments facing onto the inner courtyard give you the peace and quiet you are looking for after a strenuous day in the city. For informal meetings and relaxation we offer a stylish hotel bar as well as a lobby in the front building. Our attentive staff indulge you with a full range of services and make every effort to assist self-caterers too. House Rules City Aparthotel München takes special requests – add in the next step! City Aparthotel München accepts these cards and reserves the right to temporarily hold an amount prior to arrival. Please note that for stays longer than 14 days, there will be a end cleaning fee of EUR 100. Please note that for the Roof Top Suite with Private Roof Terrace a security deposit of EUR 500 is required. Please note that the property now offers high-chairs (free of charge, and on request) and a baby phone (on request and subject to a security deposit of EUR 80). Cots/cribs are provided free of charge. Centrally located, well equipped apartment. Staff was helpful and the location was fantastic. To be at Bauma 2019 period is quite expensive all over Munich. The breakfast was good, the restaurant staff was a bit rude to us. The Indian food was good. Location is the biggest plus point of the property. The bed was very, very hard and very uncomfortable. The A/C was not switched on in the hotel due to the time of the year. The heat was turned up so had to sleep with the window open. In the middle of a city with sirens every 10 minutes and drunks screaming every 15 minutes it made for a very restless sleep. The staff were extremely friendly and the location was just perfect. Very clean hotel. Breakfast was fresh and very tasty. The staff we also extremely helpful with directions and tips on the city and where to go. It was quite pricey for the location and facilities. It was not what we expected and the accommodations felt very utilitarian. There was a washer located in the bathroom, but it did not have a dryer option. You have to request a key to the hotel's dryer room in the basement. Didn't bother, so I can't say what that was like. Breakfast was basic and average in quality. The staff were friendly and helpful. Short walk to pedestrian areas (shopping, restaurants, etc.). There is no AC during winter only heater, we need to open the window when feel hot unfortunately very noisy from the road. It is combination hotel and apartment. It is very easy for check in, the staff is very helpful and cooperatively explained aour questions. It is closed to old Town, just walking distance. We can cook on the room. It is very easy check out. The cleaning service did good job to clean our room. It's located surrounding halal restaurants. Apartments are behind main building with little security to gain access..
Room was ok, I thought it was expensive for the quality of room, but location was good so that’s where the money is.. I wish there was continental breakfast. I also wish there was earlier check in. Room temperature way too hot, air con didn’t work. Was told to open the window. Bed was hard. Room was tiny and no space to have suitcase. Cleaners dropped our personal toiletries on the shower floor and left them there. A bit far if walking back and forth to Munich Central Station. Overall is great! Clean room, good kitchen, nice staff.